This page attempts to make some sense, in general, of how all the pieces fit together to create a RepRap. However, if you want to skip all this stuff and get straight to getting your hands dirty then your best bet is to take a look at The incomplete RepRap beginner's guide and the build instructions category. In addition to those guides, you may also want to take a look at the links under the Models section below. These days there are a growing number of many great and detailed build instructions for RepRaps! Click on the name below the pictures to see more about each design. If you're steampunk or just like to get away without commercial kits, there are also RepStraps. Another looser category of CAD tool would be apps that represent parts as a 3D Polygon mesh. These applications are meant to be used more for special effects and artistic applications. They also seem to be a little more user-friendly. FLOSS-apps in this category would be Blender and Art of Illusion. Proprietary tools are Autodesk 3ds Max, Autodesk Alias, SketchUp and more. Furthermore, you can create forms with just a web-browser at certain websites, such as TinkerCAD.com (easy) or 3DTin.com (more sophisticated), those permit you to download the resulting geometry. If you want to print as less possible material as possible; design parts optimised by volume in function of strains, you may use topology optimization through non-commercial-use-only software such as Topostruct (see sawapan.eu website), BESO, or free-open-source-use such as Topy, a topology optimization software written in Python by the brilliant William Hunter (see google code topy page). It might be useful to have a lattice engineering software, that will create a support of your part or fill the part to save material. One of the most used is Materialize Magics, but there is also Netfabb. Both are proprietary software's, not free. 1) The most common way is to interpret G-code in the firmware of a microcontroller. Typically, the microcontroller is AVR-based which is what's used in the Arduino. In order to transfer the g-codes to the microcontroller, you need a way to send the g-code to the microcontroller. See below for more details. 2) The alternate way is to interpret G-code using software that runs on a multi-purpose O/S such as linux. Two examples are EMC and Redeem. With these types of interpreters, THERE IS NO GCODE SENDER. The operating system communicates directly with special hardware that controls the motor signals. For EMC, it typically uses the computer's parallel port. For Redeem, it uses the PRU built into the Texas Instruments ARM CPU on the Beaglebone Black. Some electronics like Smoothieboard require a custom firmware. After your microcontroller has its firmware loaded, it is ready to accept G-codes via the software-emulated RS-232 serial port (aka COM port). This port shows up when you plug in your arduino to the PC via USB. You can either use a program to send these G-codes over the serial port or you can type them in by hand if you fire up a plain-old terminal application like hyperterm or minicom. If you use a program, they generally take files in gcode format. The controller is the brains of the RepRap. 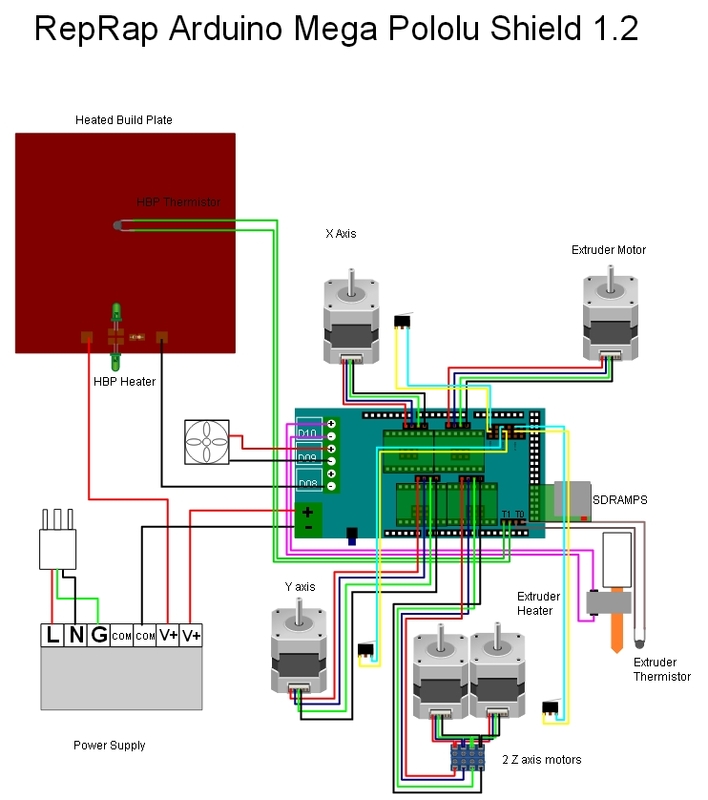 Almost all RepRap controllers are based on the work of the Arduino microcontroller. While a lot of variations exist, they are exchangeable and basically all do the same thing. Sometimes the controller is a stand-alone circuit board with chips on it, sometimes the controller is an Arduino Mega with an add-on board (called a 'shield'). Find more at List of electronics. A stepper motor is a type of electric motor that can be accurately controlled with the controller. Most RepRaps use four or five stepper motors. Three or four motors control the x/y/z axis movement (sometimes the z axis is controlled by two motors) and one motor is used per extruder. When it comes to accuracy, the most important part of your RepRap is your belt/pulley combination. Current state of the art is the GT2 belt, along with a machined pulley that matches the exact bore size of your stepper motors (normally this is 5 mm). This page was last edited on 9 March 2019, at 16:59.